Time has come to 2015 back to school season. To warm up a new school season in advance, WonderFox gives away its thoughtful gift pack of WonderFox Video Converter Factory Pro and WonderFox Document Manager this time for worldwide students, teachers and parents. The official 2015 back to school giveaway is totally unconditional and will last until Aug 31, 2015 to benefit more participants. With the help of these 2015 back to school software, you can effortlessly manage your document files and class notes, play back video/audio course you recorded anytime and anywhere. 2015 back to school gifts are available with the Zip packs including installers and registration keys once participants click the "Get it free NOW" button. There are no accounts or email addresses needed. Learn more about 2015 back to school giveaway and take full advantages of the most valuable gift for your study and work. 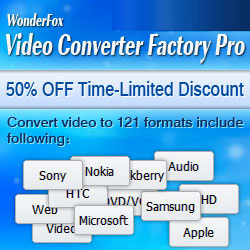 WonderFox Video Converter Factory Pro is designed for video & audio transcoding. It's the best helper for offering offline video and audio playback in portable devices. - Convert video/audio format like AVI, MP4, MKV, WMV, MPG, MOV, MP3, OGG, AC3, AAC, MKA, WMA, FLAC, M4A, etc. - Convert video to portable devices like iPad, iPhone, Android Tablet, Samsung Galaxy phones, Apple TV, HTC, Nokia, Blackberry, Sony, TVs, XBox, Wii, Kindle Fire, Surface, etc. - Support GPU acceleration to boost 30-50X faster video conversion speed. - Adopts Variable Bite Rate (VBR) which offers better quality in a smaller file size. - Support batch conversion mode to convert up to 10 video at once. - Simple editing feature like trim, crop, rotate, merge, add video effect. WonderFox Document Manager is a document management program which can manage your daily office documents conveniently. It is a must-have software for making you more productive and efficient. - Better classify, manage and organize document files. - One-click to backup document files. - Encrypt document files to protect content privacy. - Advanced search to help find target files from your large amount of documents. 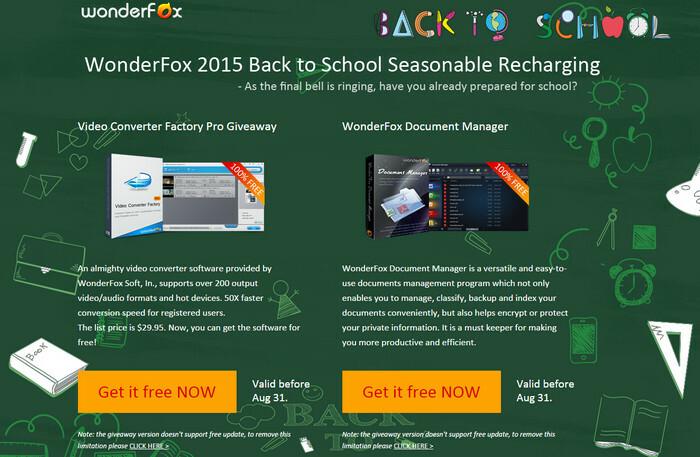 WonderFox Video Converter Factory Pro v8.7 and WonderFox Document Manager v1.2 are totally free as 2015 back to school gifts, valid through Aug 31, 2015. The giveaway version works the same as Full Version, you can enjoy all features and functions without any limitation. But it doesn't support future update and technical support. WonderFox Soft, Inc. (www.videoconverterfactory.com) is a multimedia software developing group, specializing in making practical and intuitive software. As a leading video converter provider, WonderFox is dedicated in providing users one stop multimedia solution, from PC to home theatre and portable devices. WonderFox aims to produce the most satisfactory software and provide the best service for software users. Due to its high-end quality and seamless service, WonderFox have about 3,000,000 loyal customers all over the world.